Days after attending the panel discussions, Precarious Academic Labour? 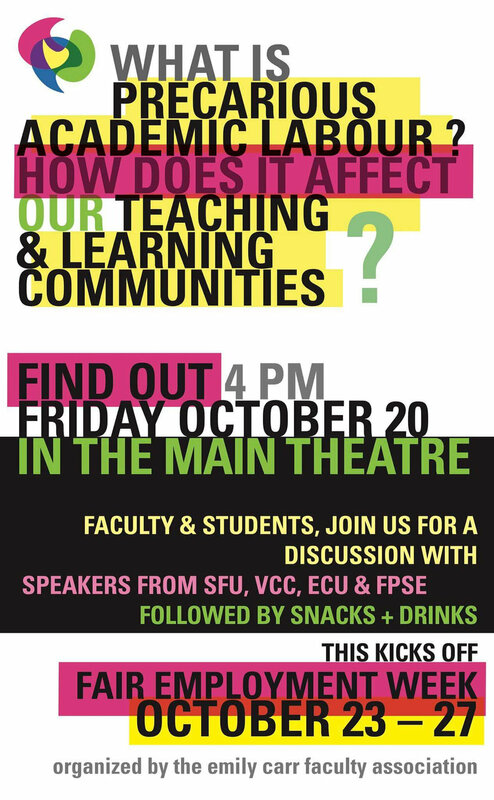 How does it affect our Teaching and Learning Communities organized by the Emily Carr Faculty Association (FPSE Local 22), I had a conversation with a close friend about her frustrations with contract teaching. After chatting about her challenging experiences as a contract faculty our talk ended with me (half-jokingly) saying, “The Struggle is Real Dude!” in my best surfer voice. We both laughed. But, only for a moment, because, sadly, the struggle of contract faculty in academia is far too real. My friend has been a sessional and contract faculty instructor for the past 5 years. Her contract ends in April 2017. She is once again on the job market with few postings in her field. She feels isolated. She doesn’t want to talk to her “colleagues” about her current struggles and worries because these same colleagues could interview her for a job one day. Recently, a tenure-tracked male colleague commented on how she is a “good sessional” because she is not all bitter and angry like the others. She sarcastically laughed at how in a precarious work situation she, and other women, are still performing emotional labour to make sure the tenured faculty aren’t negatively impacted. She is angry, frustrated, and mostly disheartened that after 10 years of education and training she cannot land a job that will support her family. This conversation reflected many of the themes discussed on the October 20th panel. There was a stark and unsettling irony in discussing academic working conditions in the auditorium of the shiny new (and corporate sponsored) campus of the Emily Carr University of Art and Design (ECUAD) in Vancouver. The panel was moderated by Rita Wong of the Emily Carr Faculty Association and had speakers from SFU, ECUAD, and VCC, and revolved around issues faced by “non-regular faculty” (meaning sessional and lecturer instructors). Such faculty are now the majority of instructors at ECUAD, are paid less than regular faculty, have to apply for their courses every term (have no job security), are not compensated to do any non-teaching activities such as curriculum development, not represented in school governance, and have no health plan. During the panel discussion, Ben Anderson (SFU) discussed the repercussions of the win coming out of recent TSSU work action and raised key questions about the role of tenured faculty—how they could be allies and advocates but there is instead a disconnect. Frank Cosco, a union activist from VCC discussed the importance of getting all members involved, paying attention to university budgets and their surpluses, and how the burden for challenging precarious work currently rests on the shoulders of the people most affected, non-regular faculty. Terra Poirier, a student in 4th year photography at ECUAD, discussed precarious faculty work from a (much-needed) student perspective. She discussed how many of the problems faced by non-regular faculty aren’t immediately obvious to students because sessionals are in practice absorbing the pay disparities by working many hours for free. She shared how the current model of making sessionals apply every term means that courses are created mere days before term starts, making beginning of term stressful for students and instructors alike. She also discussed how this instability means high turnover and the inability to have long-term mentors, as well as the problems with non-regular faculty not being compensated to do service for the university, like curriculum development. Finally, she noted the gendered aspect of precarious work and argued that such exploitative labour practices should be a concern to any artist who cares about social justice, and urged students to start working on this issue. The post-panel discussion amongst non-regular faculty at ECUAD reflected all of these themes and more frustrations including lack of adequate office space, questions about how to build community in a time of precarity, and the struggle of designing and teaching finite courses that may or may not be taught again. As a long-time union activist and a member of the Kwantlen Faculty Association (FPSE 5), there were several take-home messages from this talk but a couple that really stuck with me. How do tenured and permanent faculty support contract faculty and challenge precarious work on our campuses? How can we change this move towards precarious labour to create future jobs for our students who want a career in academia? We have the job security and the associated privileges to instigate change. In the post-panel discussion, I heard contract faculty say they feel isolated, not invited to participate in departmental events (or paid to do so), and wanting to collaborate with regular faculty. As a permanent faculty member, these are all relatively easy things for us to do. Talk to our colleagues like peers? Be sure that people are included? Yes, many of us don’t do these “simple” actions and by not doing so perpetuate the stratification between colleagues. And even more is needed. In my experience it is often those struggling in precarious working conditions who do the organizing, the agitating, and the challenging. In addition to building community, we permanent faculty can do more and should. It is time to get moving!